This Q-Connect Guillotine features a durable stainless steel cutting blade and all metal cutting table. The guillotine also features printed guides for accuracy and a cutting guard for safety. 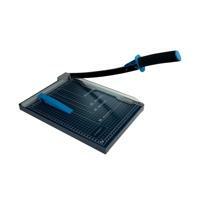 This A4 guillotine has a cutting length of 320mm and a capacity of up to 10 sheets of 80gsm paper.